We love the holiday spirit that is in the air! Centerville, TN, town square holiday lighting 2014. Outdoor Lighting Perspectives of Nashville is proud to share the excitement in and around the Nashville region that marks the arrival of the holiday season. From homes to historic venues we are entering the “countdown” period when locales all over Middle Tennessee will be “flipping the switch” as holiday lighting brings the magic of the season to life. We have been busy designing and installing holiday lighting for many of the holiday ceremonies scheduled to take place over the coming weeks including the festivities taking place in Historic Centerville, TN. 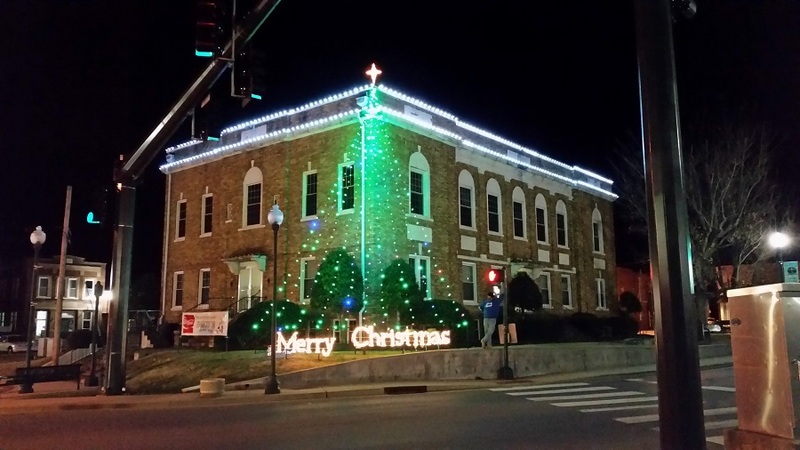 2015 marks our 2nd consecutive year in providing the holiday outdoor lighting at the Centerville, TN, town square. Our design this year is very similar to the display we installed at last year’s event, including a mixture of classic C6 and C9 LED bulbs for nostalgia. We do have a few surprises in store for this year, but we can’t give away any spoilers just yet! The display will also be fully operable through a convenient wireless remote control. Don’t miss the Christmas Open House at the Centerville Town Square! Saturday, November 28th from 5-9 pm is when all the magic will happen including a live nativity scene, story telling, horse-drawn carriage rides, a children’s coat drive, music and of course Santa will be there too! Many local businesses on the square will be open late for you Christmas shopping with the courthouse lighting on schedule for 6:00 sharp! Contact Outdoor Lighting Perspectives of Nashville to learn how we can make the holiday lighting at your home or business memorable. Call us at (615) 373 – 0638 and make this Christmas a time to remember and cherish. The Excitement is Mounting in Historic Downtown Centerville! 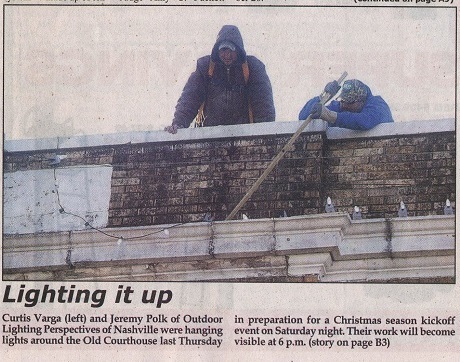 Our “in progress” installation made news in the Hickman County Times! Here at Outdoor Lighting Perspectives of Nashville we are proud to be able to share the excitement marking the arrival of the holiday season. From homes to historic venues we are entering the “countdown” period when locales all over Middle Tennessee will be “hitting the switch” as holiday lighting brings the magic of the season to life. We have been busy designing and installing holiday lighting for many of the ceremonies scheduled to take place over the coming weeks including the festivities taking place in Historic Centerville, TN! We want to invite you and your to witness the magic first hand! Mark your calendar for November 29th 5 pm – 8 pm., for the Hickman County Chamber Christmas Open house! Many businesses on the square will be open late for you Christmas shopping and the historic Courthouse has been beautifully lit for Christmas by Outdoor Lighting Perspectives! The “switch” is set to flip promptly at 6 pm. We designed the display using a mixture of classic C6 and C9 LED bulbs to add an air of nostalgia. The display is also fully operable through a convenient wireless remote control. In addition to shopping and enjoying the holiday lights, Crossroads Cowboy Church Praise Band will be performing Christmas music, Santa Claus will be visiting with children in the Chamber office. Hot chocolate and hot apple cider will be available inside the historic Courthouse and members of Historic Downtown Centerville, Inc. will be selling the Courthouse Christmas ornament and the old “Centreville” Hotel ornament. It’ll be a great family time you don;t want to miss! You can see more holiday lighting magic on our website and in our Houzz image galleries!